The National Black Theatre in Harlem, New York, guests will experience a special invited guest poet, NEA award-recipient and American Book Award Winner Sonia Sanchez alongside the Grammy-award winning pianist and Latin jazz master-composer Arturo O’Farrill. spiritchild will return with his acclaimed hip-hop jazz outfit, Mental Notes, and the youth artists of Art Start. Award-winning hip-hop journalist Rosa Clemente will be speaking as well. 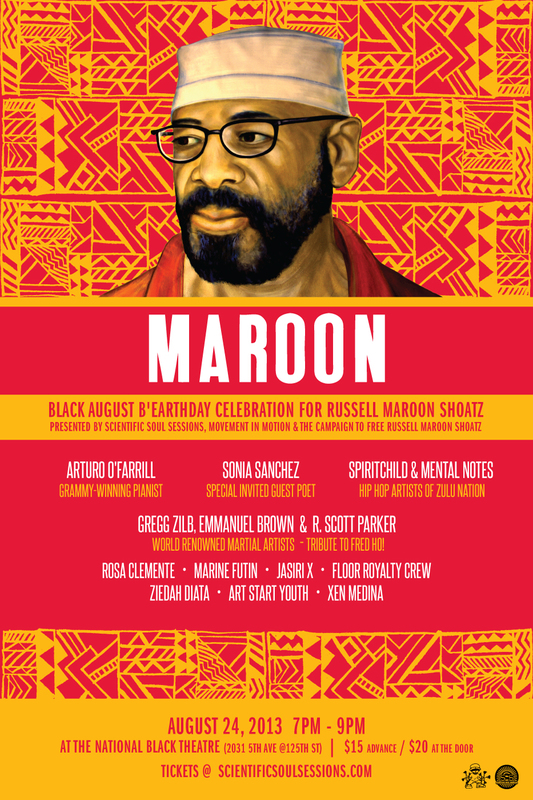 Finally, Movement in Motion’s and Zulu Nation’s visual artists, Ziedah Diata and Xen Medina, respectively, will grace the theatre with aesthetic tributes to Maroon.